The device has an Override emergency dry contact port (PANIC - GND) for fire emergency applications. When receiving the fire signal from the fire control center, the device will preferentially open the first loop as an emergency lighting circuit according to the signal. Eight independent input/output channels form a one-to-one loop. The control of each channel loop can be configured through software. Each channel has a separate transient surge protection circuit and surge protection can reach 220V 16A. Each channel is allowed to pass a resistive load current of 10A or inductive load current of 5A, and supports control of motorized curtain motors. The module can be managed visually and centrally through SCHIDERON Intelligent Lighting Management System (LMS). The data of each channel in the device can be uploaded into the intelligent lighting management system for device data management and status analysis. Scene management is to preset the time to the device through the LMS, and then turn on the corresponding scene mode to reach all or part of the device loop. “Modular” equipment is flexibly installed and applied in the actual environment. The module is mounted on a standard 35mm DIN rail, providing convenient installation and maintenance for users. The module is designed for the MCU pure hardware architecture and has local data processing and channel control. The overall power consumption of the module is low and the task processing is timely. The module communicates via the dedicated bus S-Net to ensure the stability and reliability of data transmission. Each device has a corresponding physical address. The DIP dialer can be used to set the device's address to ensure that each module can operate correctly and accurately receive and execute commands transmitted from S-Net. 8-way 10A relay switch module (HRMS-RL-C08/10) is an 8-channel relay control device for 120VAC to 240VAC for incandescent, fluorescent, neon/cold cathode, etc., 8 independent input/output isolation Channels and 8 emergency switch buttons allow manual switching of the circuit without bus devices and software. 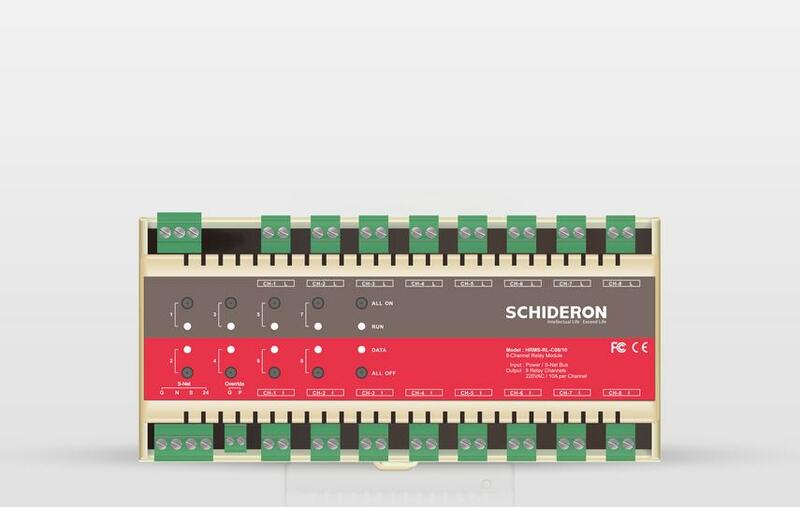 Each channel allows 10A resistive resistive load current or 5A inductive load current, and supports electric curtain control and fan control. Intelligent lighting management system (LMS) can be used for independent loop control, pre-editing scene control and scene timing control. Device data can upload module local data to intelligent intelligent lighting management system (LMS) for device status management and statistical data analysis. The transmission and equipment control meets the latest industrial industry standards.